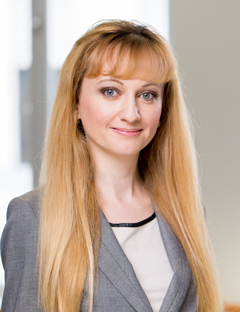 Irina concentrates on the research of the global ETF and Index universe, analysis of asset classes and ETFs, and economic research applied in the firm’s investment process. She operates and maintains the firm’s financial models for portfolio construction and data analysis, as well as contributes to asset allocation decisions. She also manages relationships with ETF and Index providers, as well as brokers for trade execution. In addition, Irina brings over 10 years of diverse work experience, including having worked at the Turkish Embassy in Moldova where she concentrated on economic research and commercial aspects of the Embassy’s mission in Moldova. She also brings business experience, along with extensive research and financial duties performed at a German technology company. Irina has a degree in Economics from the Academy of Economic Studies of Moldova. She holds the Chartered Investment Manager designation and is a registered Portfolio Manager — Advising Representative with the Ontario Securities Commission. Irina speaks several foreign languages including Romanian, French, Italian, and Russian, that she used during her employment overseas.